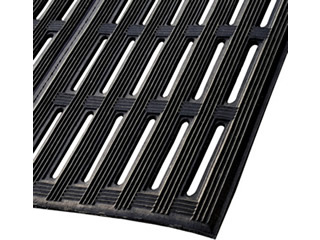 Description: Heavy duty 1/2" open slot design rubber industrial matting with nylon fibers (as tough as a tire). Manufactured with 80% recycled rubber content. Offers superb drainage for greasy, wet oily areas. Excellent for areas where forklift or wheeled carts are used. 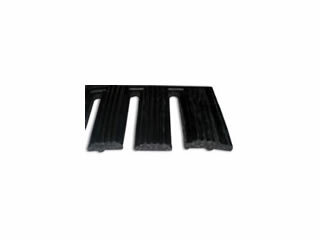 Ideal matting for welding, machining and heavy assembly areas, grating and catwalks. Multi-directional ribs provide excellent traction and comfort. Grease resistant nitrile rubber blend. Custom sizes are available in 2', 3' & 4' widths up to 22' in length. Recommended Use: Excellent for areas where forklift or wheeled carts are used. 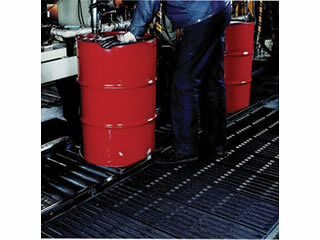 Ideal matting for welding, machining and heavy assembly areas, grating and catwalks, machine shops or production areas where oil, chemicals and solvents are present.